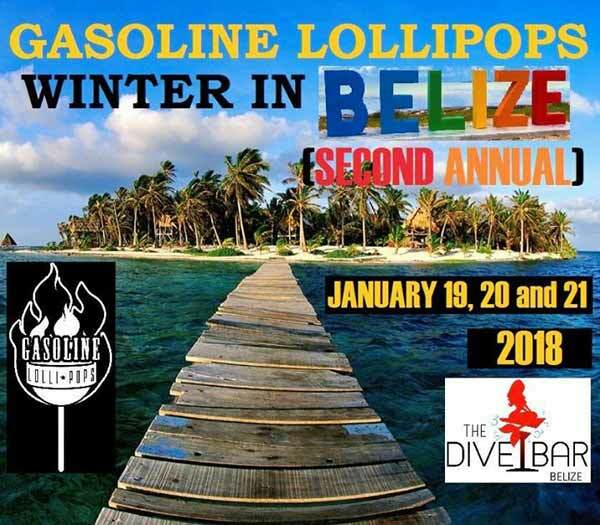 If you missed out last year or want to dive into another Caribbean adventure, join Gasoline Lollipops for THREE shows in Belize - Friday, Jan 19, Saturday, Jan 20 and Sunday, Jan 21, 2018. At The Dive Bar At SeaStar - Just North of Tres Cocos Resort 1/2 mile North of Bridge. 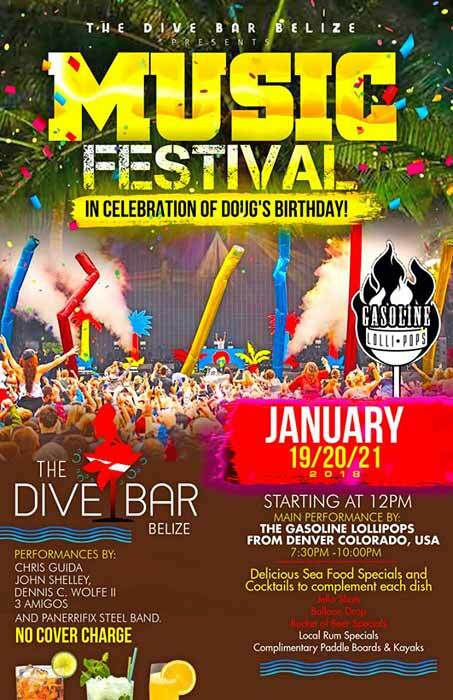 The Dive Bar Belize is hosting a Music Festival in celebration of (owner) Doug’s Birthday. Noon start this coming Friday and running each of the three days until 10:00 PM. Featuring performances by The Gasoline Lollipops from Boulder, Colorado, USA. Other musicians playing: with Dennis C. Wolfe II and reggae band, Chris Guida, John Shelley, Tres Amigos, and Panerrifix Steel Band. Additional reasons to attend: seafood specials and cocktails, Jello shots, a bucket of beer specials, local rum deals, and as always complimentary paddle board and kayaks. Don’t miss the Gasoline Lollipops at The Dive Bar this weekend January 19/20/21 in celebration of the owner’s Douglas Mclain Birthday! There will be local artists performing live music from noon to midnight. Main performance by the Gasoline Lollipops starts at 7pm. Live music and special performances by Dennis Wolfe II and his reggae band, John Stanley, Chris Guida, Tres Amigos and the Panerrifix Steel Band from Belize City. There will be plenty of Seafood Specials and tasty cocktails to complement each dish. See you at The Dive Bar where the fun under the sun starts at Friday, Saturday, and Sunday at noon! NO cover charge.